A popular Tokyo noodle shop has vaulted into the world's top ranks of restaurants by becoming the first ramen eatery to receive a Michelin star. The food bible's latest edition of its Tokyo guide gave the rating to Tsuta, a tiny nine-seat restaurant in the north of the city. Ramen is an ubiquitous dish in Japan which has its roots in Chinese noodles. It is widely seen as a type of fast food, although more shops have been offering gourmet options. The Tokyo Michelin Guide also lists 27 other ramen shops, but they are under its Bib Gourmand section which is below its three-star system and emphasises cheaper restaurants. Tsuta -which sells bowls for $7-$9.75 (£4.50-£6.50)- is known in Tokyo for its fusion ramen and has been called "the finest ramen in northern Tokyo" by The Japan Times. The Michelin guide recommends Tsuta's ramen flavoured with red wine and rosemary barbecued pork, as well as its ramen with a "memorable porcini mushroom fragrance". 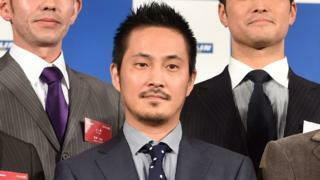 One of Tsuta's cooks, Takatoshi Itami, told AFP news agency: "The most important thing is that customers like our ramen. We have good reviews thanks to them - getting a star was not our priority."